It’s timely at this time of the term to remind teachers and students that they can use the information below about Referencing @MtA as well as our iCentre Tutorials with instructions of how to use CiteMaker, to support their research assignments. 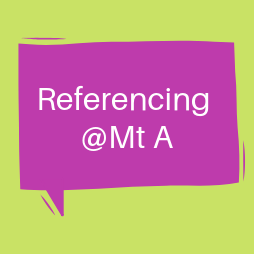 APA: APA referencing requires both in-text referencing and a Reference List at the conclusion of a piece of research. In-text references occur when you cite or paraphrase an author within an assignment. Every time a student uses another person’s work or ideas in an assignment, they must immediately acknowledge the author/authority (or the title of work if the author is unknown), plus the year of publication (if known), and the page number/s (or paragraph number for an online article).